On Saturday, I attended Shabbat services in Honesdale PA, in the foothills of the Pocono mountains, in the same temple where my father became a Bar Mitzvah in 1937. The Delaware and Hudson Canal Company built this white clapboard synagogue with a steeple on the banks of the Lackawaxen River in 1856, in order to serve local Jewish merchants. Each year, more than 50 family members and friends return from across the country for a massive Thanksgiving meal, and to celebrate important rites of passage together at Congregation Beth Israel. And so this year, as the convergence of Hanukkah and Thankgiving approached, we traveled from at least six different states, through snowy mountain passes, to witness my cousin Nora become a Bat Mitzvah. Nora lives outside Boston, but she is part of the sixth generation of our family to worship in what was once the tiniest temple in America. Throughout Shabbat, throughout a long weekend together that included celebrations of Hanukkah, Thanksgiving, the Bat Mitzvah, and my sister’s wedding, two themes recurred: Jewish continuity, and the inclusion in our family and our Jewish practice of people from across the world, and from across the spectrum of religions. As always, as we entered the sanctuary, I searched the memorial yahrzeit plaques on the back wall, to find the names of my grandparents. In earlier generations, my family tree included cousins who married each other for lack of Jewish partners, as well as great-aunts and great-uncles who never married, never had children, for the same reason. Going through a box of photos from the last century in my grandmother’s house this week, I came across a photo with this scrawled on the back: “Leon’s Catholic girlfriend”. I adored my great-uncle Leon. He played fiddle, and worked in the family department store in Honesdale, and drew pictures of cats for us when we visited him at Katz Bros. The fact that he remained a bachelor uncle because he could not marry his Catholic sweetheart is poignant. In the next two generations of my family, there have been a dozen happy interfaith marriages, starting with the wedding of my parents in 1960. Nora’s parents, my cousins Sig and Ruthie, are, like my own parents, Jewish and Episcopalian. I sat with my father and mother, now 89 and 82 and well past their 50th year of marriage, in the temple on Saturday morning. My teenage children sat up in the choir loft, singing with their first and second and third cousins. Before Nora read from the Torah, we unrolled the scroll and wrapped it around the tiny sanctuary, circumscribing our radically inclusive community. My mother, who shepherded four Jewish children through the Bar and Bat Mitzvah process in the 1970s and 80s, was thrilled to be allowed to touch the parchment for the first time. Then Nora’s 91-year-old grandfather, my very erudite cousin Bill, who has spent most of his lifetime in this little town, devoting himself to Beth Israel, said the priestly blessing over the Bat Mitzvah girl from his wheelchair. There may have been one or two dry eyes in the house, but I couldn’t see them through the mist of my own tears. In his words to Nora after her Torah reading, my cousin Sig referred to our synagogue as tiny but “huge if judged by the size of its metaphorical tent.” As a family now encompassing Jews and Catholics and Quakers and Episcopalians and Buddhists and humanists, those related by blood and those related by choice, we crammed into the familiar pews. We represent roots reaching from China to Italy, from Japan to Ireland, from Armenia to Colombia. 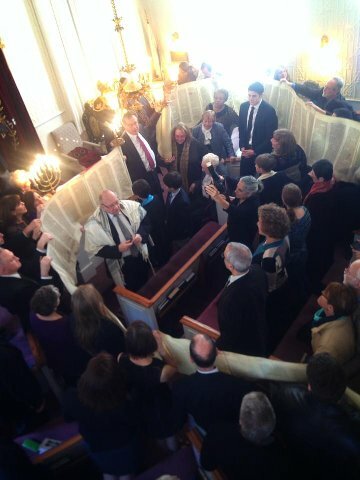 And on Saturday, people with African, Russian, Danish, Polish and Dutch ancestors recited blessings over the Torah. As a family, we cling to our quirky Classical Reform ways, eschewing yarmulkes and persisting in our love for familiar German tunes played on the organ, as well as incorporating Bach and Paul Simon and anyone else we please into our services. And yet somehow, we have not assimilated out of Jewish existence, through six generations at Beth Israel, and through three generations of being an interfaith family. My siblings and I have each made different decisions about the religious labels of our children, but all of us return to Honesdale, all of us return to Beth Israel, all of us are passing on love for Judaism. On the night before Nora’s Bat Mitzvah, on the only night of the year that is Hanukkah Shabbat, my parents watched their seven grandchildren (some Jewish, some Catholic, some interfaith) light candles, say blessings, and sing Rock of Ages together. Recently, my Catholic nephew has been asking to learn Hebrew. So my daughter Aimee, who was raised in an interfaith community, with education in both Judaism and Christianity, taught her youngest Jewish and Catholic cousins to play dreidel. And thus she taught my nephew his first four Hebrew letters: nun, gimmel, hay, shin. My father left Honesdale PA at age 17, but more than 70 years later, he still pays membership dues to Beth Israel. By the end of last week, my brother, the one raising three Catholic kids on the West Coast, had agreed to join the congregation as well. This is kind of crazy given the reality of geography, but also kind of gorgeous, and it makes sense within the context of our family. Our cousin Liza has agreed to be the next president of Beth Israel, and I trust that her creativity and open heart, her love of history and her embrace of all, will keep the congregation vibrant. Even if the Jewish ancestry in our family is but a single drop of holy oil, that drop will burn brightly for all to see, miraculous. Hanukkah feels strange and slightly melancholy this year, with our firstborn away at college. With only one teenager left at home, I declared the official end to kids hunting for little Hanukkah gifts hidden under sofa cushions and behind bookcases. My son was fine with this. Adults rarely give each other Hanukkah gifts in my extended family, and he is well on his way to becoming an adult. But as it turns out, I did not actually have the authority to make this abrupt and unilateral proclamation. Just because I represent the Jewish side in our interfaith family does not make me the boss of Hanukkah. So after we lit candles and said blessings and sang “Rock of Ages” on the second night, my (Christian) husband surprised me by saying he had hidden little Hanukkah gifts for me and our son. I was touched, and irrationally excited: I hadn’t hunted for a present since I was a kid and my (Christian) mom instituted this Hanukkah tradition in our family. My bemused son and I quickly located the little tissue paper packets–in a clay pot on the mantel, and on the windowsill behind the curtains. They turned out to be utterly fabulous, completely cheesy blinking LED Hanukkah pins–a menorah and a dreidel. I wore them both at a Hanukkah party the next night. So my husband created a moment of role-reversal comedy (mom acting like a kid and receiving a goofy “kid” present). At the same time, he distracted us all from missing our college girl. And he paid sweet tribute to the interfaith family created when we got married 25 years ago, and to the tradition instituted by my pioneering interfaith parents, who are still happily married after more than 50 years. Such small gestures, combining tradition and innovation, respect and humor, bind interfaith families together. 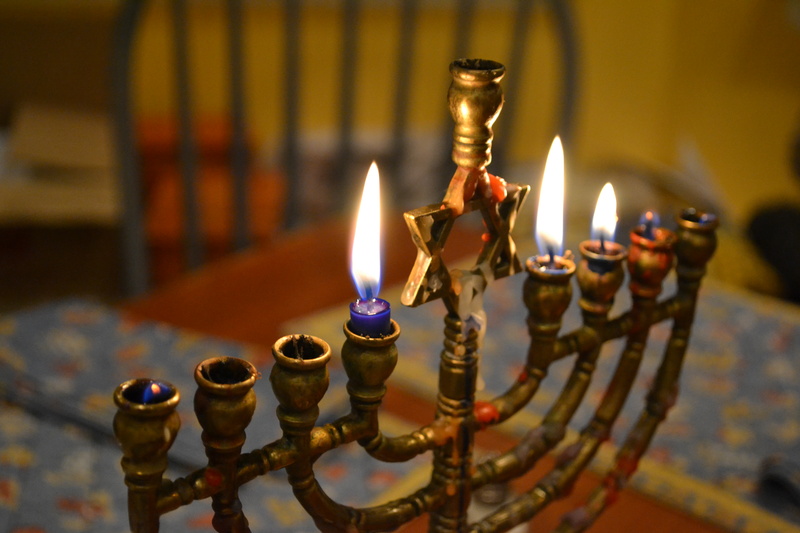 This time of year, interfaith families scour the internet for advice on celebrating Hanukkah and Christmas. For those who celebrate both December holidays, I thought I would post a roundup of the many pieces I have written on how we celebrate Hanukkah in our “raising them both” family. My interfaith kids have always loved Hanukkah, even though we also celebrate Christmas. And my mother and husband, both Christian, love harmonizing as we sing around the candles. One of my most popular Hanukkah posts was the five reasons you do not have to fear that Hanukkah will be overshadowed by Christmas. By the time our kids were teens, we put most of the Hanukkah gift emphasis on the importance of giving to others. Although we also treated them to a Matisyahu concert one year. I later admitted that going to a rock club on a weeknight did contribute to interfaith holiday burnout that year. Last year, I wrote an overview of celebrating Hanukkah, Advent, Christmas and Yule in our family, along with my photo of a Hanukkah cookie. It may have been the enticing cookie that lured WordPress into selecting the post to be featured on Freshly Pressed. 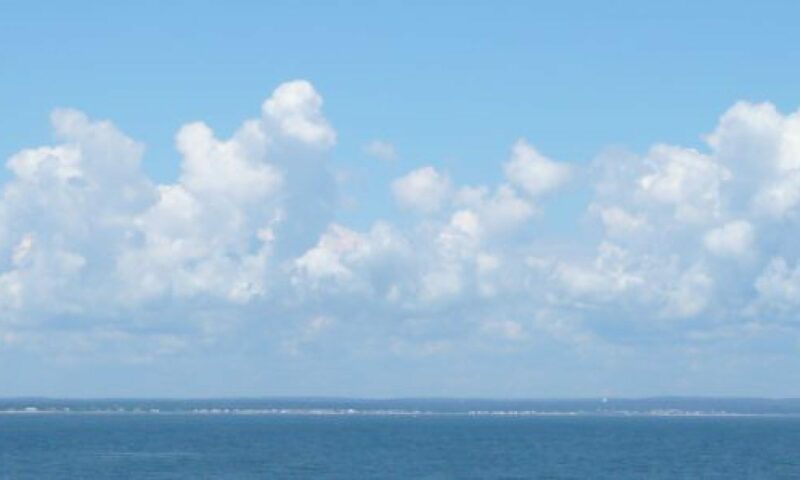 (I am proud to use my own photos on most of my posts). I also wrote a piece for Huffington Post last year on celebrating both holidays in our family. In response, a blogger for the Forward wrote an outraged post in the form of a letter excoriating me. While her post was filled with misunderstandings (we absolutely do not celebrate Chrismukkah), I hope that our exchange helped to explain to a wider audience why many interfaith families are teaching their children both religions. This year, I feel lucky because Hanukkah comes relatively early (December 8th to 16th), minimizing any awkward overlap for those of us who like to keep the holidays separate. And we do keep them separate. For our family, part of the point of celebrating both is giving each religion (and each holiday) proper space and respect and meaning. So, no Hanukkah bush or star-of-David treetoppers for us. A Christmas tree is a Christmas tree. And a menorah is a menorah (or a chanukiah, as some folks prefer to call them these days), even when it is made of plexiglass and holds glow sticks instead of candles, like the menorah I am sending today to our daughter, who now lives far away in a college dorm where she cannot light candles because of the fire laws. Sigh. I know I will see my daughter at Christmas, but it is hard to realize that she will only be nearby for Hanukkah on the years of crazy holiday overlap. Which reminds me, whichever holidays you celebrate in your family, treasure each Hanukkah, each Christmas, each Eid, each Diwali, each Solstice with your children. Too soon, they will be out and away in the great world, and you can only hope that they will be warmed by the nostalgic glow of family holiday memories. At our house, we try not to miss an opportunity to create those memories. I often wonder if people who are not born into interfaith families can ever truly understand, on the gut level, the positive aspects of growing up in an interfaith family. Whether we grow up practicing one religion, two religions, or no religions, as interfaith children we are nourished by parents who model the art of communication, respect for the other, and love that transcends boundaries. And often, in December, that communication and respect and transcendence involve Christmas trees. This week, Debra Nussbaum Cohen, a blogger for The Jewish Daily Forward, wrote a post in the form of a letter addressed to me, entitled “Interfaith Mom is Wrong About Chrismukkah.” She was responding to the recent Huffington Post piece in which I explain why my interfaith family celebrates both Hanukkah and Christmas. I respect Debra’s point of view that children being raised Jewish should not celebrate Christmas in any form. I do not believe that strategy will work for every interfaith family, not even for every interfaith family raising Jewish children, but it is a point of view that has gotten a lot of play this season. It was interesting (and, of course, for me, heartening) to note the backlash in her post’s comment section, and on twitter, mainly from adult interfaith children, many of them with strong Jewish identities, who took great exception to the tone (and to some extent, the content) of her column. 1. You write that Christianity was a radical departure from “Judaism’s basic tenets.” Many of us who have studied both religions simply don’t see it that way. I see the basic tenets of both religions as monotheism, love, and social justice. The prophet Micah, Rabbi Hillel and Jesus all seem to agree on this one. Who am I to disagree? 2. You write of the irony of “someone born Jewish” (presumably me) now “advocating” for “assimilation.” First of all, according to the Conservative and Orthodox movements, I wasn’t born Jewish (because I’m a patrilineal Jew). And I am not advocating for assimilation. I am advocating for the right of interfaith families to teach their children love for and knowledge of Judaism, even if we do not (cannot) choose Judaism as the only religion practiced in our family. Perhaps you would prefer that I just raise my children as Christians, but I am not sure why that would be good for the Jews. And I don’t happen to think it’s the best choice for my particular family, or for my children. 3. You write that interfaith families should only celebrate Christmas at the homes of their Christian relatives. But not everyone has living parents, or family close by, to host Christmas celebrations. My mother had no aunts or uncles or cousins. When my grandparents were gone, we began celebrating Christmas in our (Jewish) home with her. This was very much the right choice, for our interfaith family. 4. You write that the celebration of Hanukkah is a celebration of the fact that “to be Jewish is to be different than the American Christian mainstream.” I am troubled when Judaism is defined negatively, in opposition to Christianity. For me, Judaism is defined by ancient ritual, by the possibilities for spiritual and even mystical experience, by love of language and law and justice. Hanukkah, in our family, reminds us of the freedom we experience in America to maintain our relationship to Judaism, and the opportunity to reflect on the idea of the miraculous. You then go on to suggest that I would be a “cooler Mom” if I played the music of Matisyahu, instead of “subjecting” my children to Irving Berlin. Wow. Irving Berlin, the son of a cantor, was one of the greatest American popular songwriters of the 20th century. (I bet you Matt Miller might even agree.) I cannot imagine what could dissuade me from subjecting my children to Irving Berlin. As for my coolness quotient, you’re picking on the wrong mom. I may not wear hot pants, but I have pronounced hipster-mom tendencies. I took my teens to see Matisyahu, live, for Hanukkah last year. We danced together under the giant electrified dreidel. In short, I am doing everything I can to instill in my children an appreciation for Judaism (and Christianity). My kids feel “pleasure and pride” in both sides of their family, in both religious traditions. 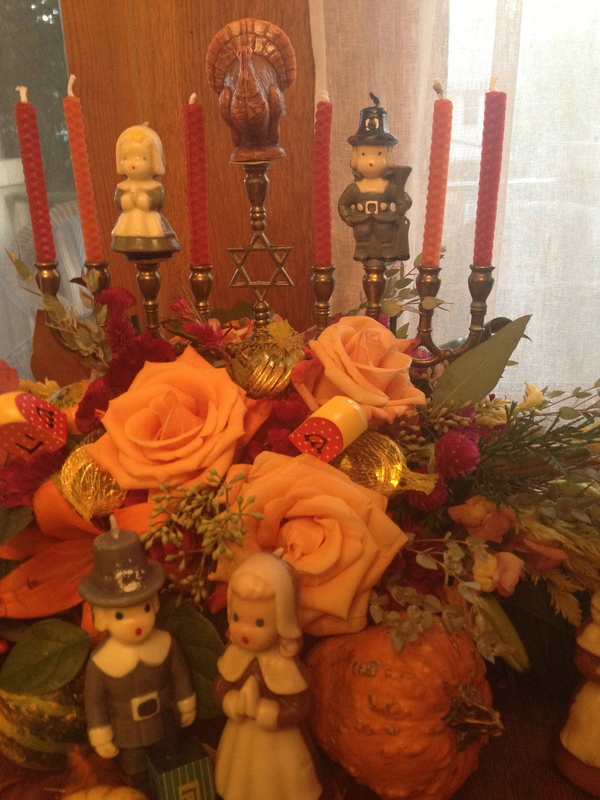 I hope you will surf around a little on this blog, getting to know my interfaith family. I know you would be happier if we could be 100% Jewish, but that’s just not how we define ourselves. This time of year, interfaith families make our annual appearance in the media. The world wants to know: How do we do it all? Are we confused? Are we superficial? Are we exhausted? For readers of this blog, my current column at Huffington Post, about why we celebrate both Hanukkah and Christmas, may seem rather obvious, but it is still stirring up a snowball fight of comments, both from people who insist we cannot do what we are doing, and people who appreciate our approach. Join the fray! Meanwhile, here’s a series of small moments from the interfaith holiday season in our family. Advent. I asked the kids (both now officially bigger than me, at ages 17 and 14) if they wanted an Advent calendar. They said yes. I bought the ubiquitous chocolate-filled cardboard calendar, at a suspiciously cheap price of $5. I checked that it was “made in Canada” and not in China. Nevertheless, the chocolate was so crummy that my son ran outside to spit it in the driveway. Advent Fail. On the other hand, I have been touched by some of the Advent offerings posted on facebook by my friends, including glorious music by the Mediaeval Baebes, and a frenetic and surreal liturgical dance by Steven Colbert, which I find somehow deeply spiritual, perhaps because I know that in spite of his hilarious cynicism, he is an ardent Catholic and Sunday School teacher. Advent win. Hanukkah. We already shopped, as a family, at an Alternative Gift Fair this year, and identified charities to fund for various nights of Hanukkah. We gave each of our two teenagers $50 to spend, and they picked out delivery of a bicycle through Bikes for the World, dental checkups for 10 Mayan children in Guatemala, one week of fresh vegetables for a local family from our local farmer’s market, and socks and underwear for our local soup kitchen. A Sprinkling of Christmas, and Hanukkah. 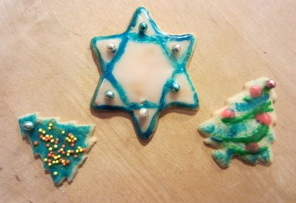 I made Christmas and Hanukkah cookies with a fabulous group of women friends. 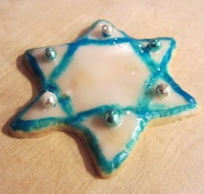 I try not to mix the holidays together, and I am not the least bit comfortable with the star-of-David tree-topper being marketed this year, but I think it’s kosher to let Hanukkah and Christmas cookies co-exist on a counter-top for a few seconds before they are devoured. Christmas, with a Little Hanukkah. We trimmed our tree this week. My husband wrapped our porch with lights, and then the kids had their trip down memory lane unwrapping the ornaments. Usually, we listen to Christmas classics while tree-trimming, but because we are all still smitten with the Pink Martini holiday album from last year, we allowed a tiny bit of Christmas/Hanukkah crossover to occur when their irresistible version of Flory Jagoda’s Sephardic Hanukkah song “Ocho Candelikas” (with guest vocals by NPR correspondent Ari Shapiro) came on. Welcome Yule! We heard a rousing live version of Ocho Candelikas this week, at the Christmas Revels, believe it or not. Every year, the Revels weave together some of the pagan and Celtic influences on Christmas. This year’s Revels was a brave departure, as it was set in the “golden age of Al-Andalus,” on the Iberian Peninsula in the medieval period when Jewish, Muslim and Christian cultures co-existed and recombined. We have been cautioned by academics, recently, not to over-romanticize this period, and the program at the show carefully pointed out that the “level of tolerance varied significantly by time and place.” Nevertheless, after years of Christmas Revels set in different historical periods and geographic settings, it was gratifying to see Judaism, and Islam, represented on the stage. And I see no reason not to be inspired in this season by the vision, however ethereal and ephemeral, of a time and place for religious harmony. It’s easy to gripe about holiday music. A dearth of good Hanukkah tunes. Too many cheesy strings. Novelty songs about reindeer and snowmen. Bob Dylan dredging up material from school assemblies of yore. My approach has been to stick with the classics: brass quintets, lush classical choirs, Nat King Cole, Mel Torme. But now that I have teenagers, I must try to stay relevant. So I made an impulse purchase a couple of weeks ago at the counter of guess-which-coffee-franchise, and bought Joy to the World by a “little orchestra” based in Portland, Oregon. 1. Such visual taste! 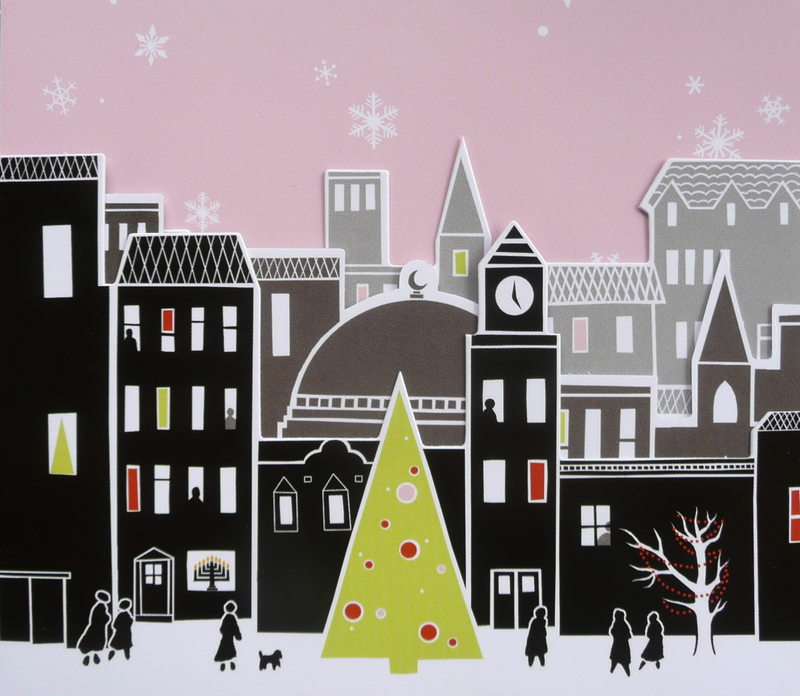 Your pale pink packaging, as comely as a cupcake, with cut-out skyline featuring a church and a mosque, and only the most subtle of references to the complementary colors of red and green. 2. Such musical taste! Spare jazz guitar and trombone, glorious harmonies, a slide guitar, a cello, an accordion, a mandolin. 3. Such intellect! The duo fronting Pink Martini, classically-trained pianist Thomas Lauderdale and singer China Forbes, met as Harvard undergraduates. Joy to the World features songs and verses sung in Ukrainian, Japanese, Chinese, French, German, Italian, Hebrew, Ladino and Arabic. Oh, and NPR White House correspondent Ari Shapiro sings (astoundingly well) on both of the Jewish-themed songs. 6. Such historical hipsterism! In interviews, Thomas Lauderdale admires the golden age of Christmas music written between 1940 and 1965. Joy to the World includes definitive renditions of two of my guiltiest secret pleasures from that era, “The Little Drummer Boy” and “Do You Hear What I Hear.” Who knew that the latter song was a plea for peace written in response to the Cuban Missile Crisis? And if you just cannot bear “The Little Drummer Boy” again, well, you’re missing something. Pink Martini will broadcast live this evening on Prairie Home Companion. Garrison Keillor got all crotchity last year on the subject of Christmas songs, I know. But how many holiday albums truly reflect the joy of our global, cross-cultural, interfaith world? Tune in, bliss out, enjoy the glow of Pink Martini.